County officials Monday announced a holiday season program to help promote road safety, and cut down on impaired driving. Police reminded drivers they will be out in force and urged people to get a free ride from the county rather than drive after drinking. According to county officials: Now through Jan. 1, 2010, selected establishments in East Hawaii and West Hawaii will offer inebriated patrons free shared ride taxi coupons as an alternative to driving away from the bar while under the influence. At the same time, police will be on heightened alert for motorists under the influence, and set up more DUI enforcement roadblocks around the island. A grant from drug forfeiture funds will purchase 500 Shared Ride coupons from the Mass Transit Agency to be distributed by the Department of Liquor Control to drinking establishments in East Hawaii and, for the first time, in West Hawaii. Bars and restaurants will provide the coupons free to patrons who are too drunk to drive and call a participating taxi company, which can submit the fare to the county Mass Transit Agency for reimbursement of up to $6 per coupon. (One coupon is good for four miles, two coupons for nine miles). On a per capita basis, the alcohol-related traffic fatality rate on the Big Island is three times that of Honolulu and twice that of Maui and Kauai. Last year, 63 percent of all fatal accidents on the Big Island were alcohol related; this year the rate so far is at 50 percent. The state average is 47 percent and the national average is 40 percent. Studies have shown the average cost of a fatal accident in overall terms including lifetime loss of income at from $1 million up to nearly $4 million. 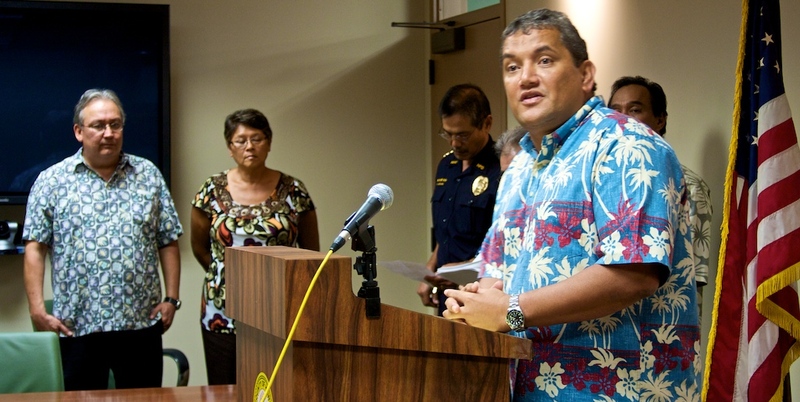 Mayor Billy Kenoi talks about the free holiday shared ride taxi program. Photography by Baron Sekiya, Hawaii 24/7.